- 10% discount for all reservations made and paid until 15 Nov 2018 (not valid during 28 Dec 2018 - 03 Jan 2019). - 7=6, 11=9 during 01 Dec - 26 Dec 2018, 13 Jan - 24 Jan 2019 and after 24 Feb 2019! *The offers can not be combined! Location: Situated amidst evergreen pine forests, hotel Finlandia is only some 800 meters away from the lifts and ski runs and within walking distance from the noisy hustle and bustle of the resort centre. Accommodation: The hotel has 153 beds in 67 spacious rooms and apartments with balconies and bathtubs. Centrally heated in winter, the rooms are furnished to the highest standards and include satellite TV, telephone, minibar, and 24-hour room service in addition to all the facilities you would expect from a luxury, 4-star hotel. Accommodation is available in 20 twin/double rooms, 20 triple and 1 single rooms, 13 apartments and 4 deluxe apartments featuring a fireplace. Rooms and apartments in detail: Single and double rooms: Cable/sat TV, telephone, mini-bar, bathroom. Extra bed is not available in the double rooms, some of them are without balcony, but there is a sleeping coach in the luxury double rooms. Apartments: Living room and bedroom (There is a mantelpiece in the luxury apartments ), cable/sat TV, telephone, mini bar, bathroom, hair-dryer, balcony. Food and entertainment: The Classic Restaurant, seating 90 persons offers buffet breakfast and daily table d'hote menus in the evening. The Barbecue Restaurant is a more attractive dining area, which will be remembered for its charcoal-grilled specialties, lamb roast on a split and homemade bread, all freshly prepared. The national style Tavern offers typical music, delicious meals and famous wines. The guests can also enjoy light dishes and a variety of snacks in the Lobby-bar or dance the night away in the Nightclub. Sports and leisure: An indoor swimming pool is located in the health centre, which also comprises a jacuzzi, a small fitness area, sauna and massage rooms with medical supervision. The wide range of sport facilities in the hotel include also table tennis, billiards and game room, guided walking tours in a summer. 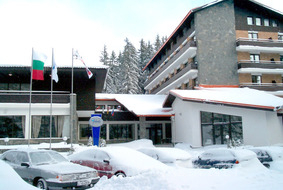 The hotel has its own ski school with English and German speaking ski instructors and a ski room to rent ski equipment from and store your own skis. Children are also catered for in the ski kindergarten. Other services: Finlandia hotel offers meeting facilities for small business service room. The guests may avail themselves from the short trips and one-day excursions to picturesque places and attractions in the region, organized by the hotel. Free baby-lift in front of hotel FINLANIDA, 50 meters long. Suitable for beginners - both kids and adults. Children creche is also available in the hotel.